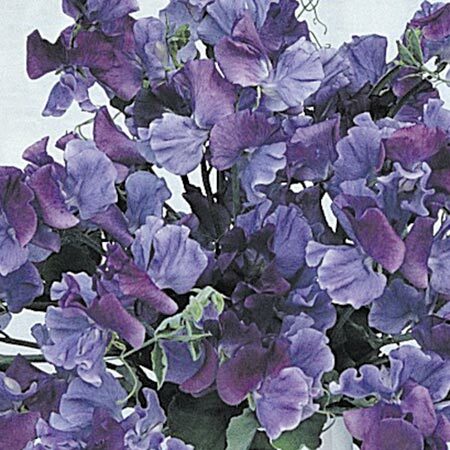 An attractive, large flowered sweet pea deliciously fragrant in shades of blue mixture blooms. Recommended for exhibition. Height 1.8m (6'). Easy to grow. HA - Hardy annual. Tall growing variety - supports will be required in the form of trellis, sticks, canes or wire netting. A stunning addition to any garden, sweet pea flowers demand to be picked - and with so many having such a sweet scent who could resist? RHS Award of Garden Merit winner. Height around 1.8m (6'). HHA/HA - Half hardy annual/Hardy annual. Scent 1. Ideal climber. Scented. Attractive to bees. Suitable for cutting. Prefers full sun. Some varieties have hard black seeds and we advise soaking them in water for eight hours before sowing. Pick sweet peas continuously so that you ensure a summer-long display.